My 17 year old niece and I were looking through posts of past lunches that I made for her. When she looked at this pie themed lunch from 2 years ago, she mentioned that it was delicious. I decided to make another pie themed lunch for her. My husband and her brother (15 years old) ate identical lunches. 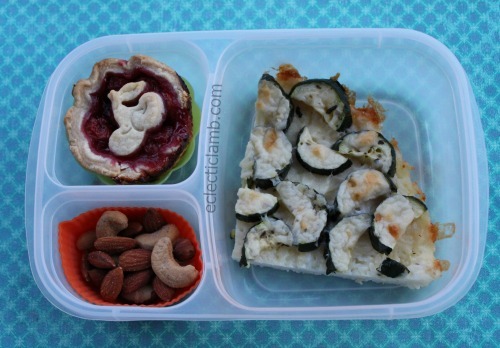 Note: This lunch is meant to be heated in a microwave so I placed the mini pie and nuts in silicone cups so they can be removed before heating the zucchini pie. Top Left: Miniature cherry pie with cherry shaped pie crust cut with a mini press cookie cutter. I based it on this recipe but made a different Martha Stewart crust, I reduced the sugar, did not use the lemon zest, and did not use a top crust for the pies. I also did not brush with an egg wash. This entry was posted in Bento / Cute Food, Food and tagged Cookie Cutter, EasyLunchboxes. Bookmark the permalink. Sounds and looks delicious!! Such a special niece – can’t believe she is graduating!!! Thank you! I agree about our niece. Each day this week I will share lunches I made for her during her last days at high school.